KOControls is a package of useful controls. It helps you to create a better user experience without a lot of effort. Right now it contains only the few features but it will be getting the new stuff, depending on the users needs. KOPresentationQueuesService – Service manages the queues of views to present. KOTextField – Text field supports showing and validating an error. KOScrollOffsetProgressController – Controller that calculates progress from given range based on scroll view offset and selected calculating ‘mode’. KODialogViewController – High customizable dialog view, that can be used to create you own dialog in simply way. 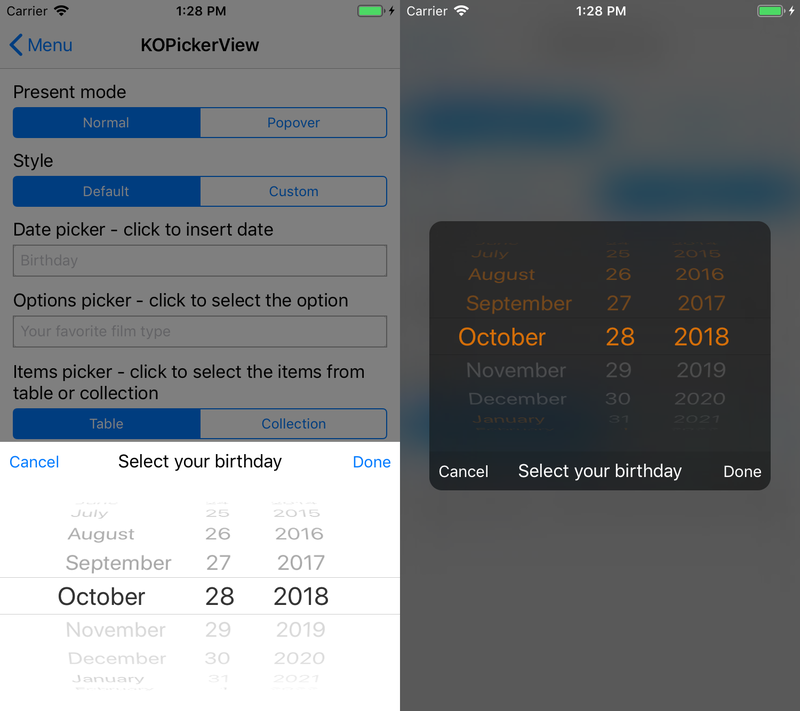 KODatePickerViewController – Simple way to get the date from the user. 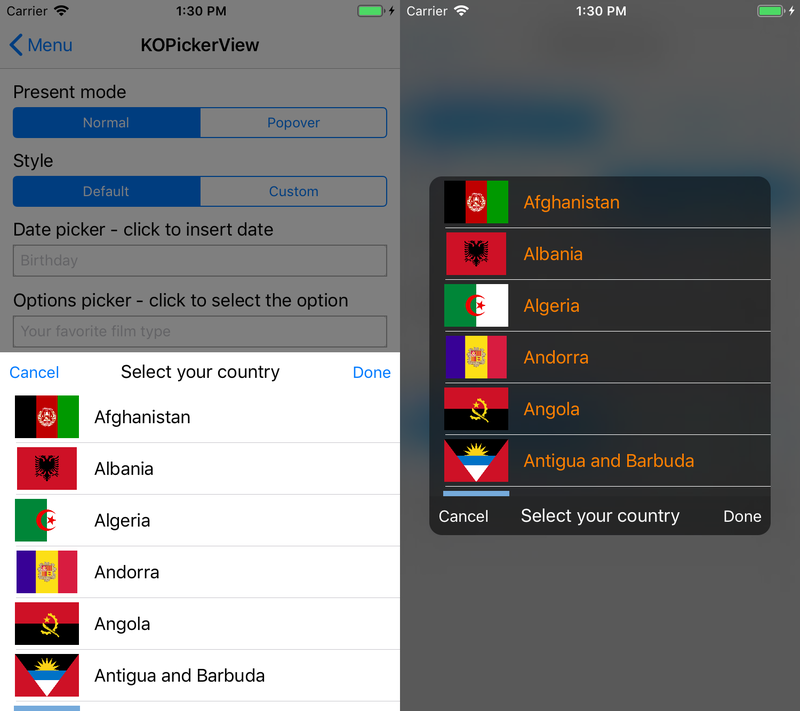 KOOptionsPickerViewController – Simple way to get the selected option from the user. 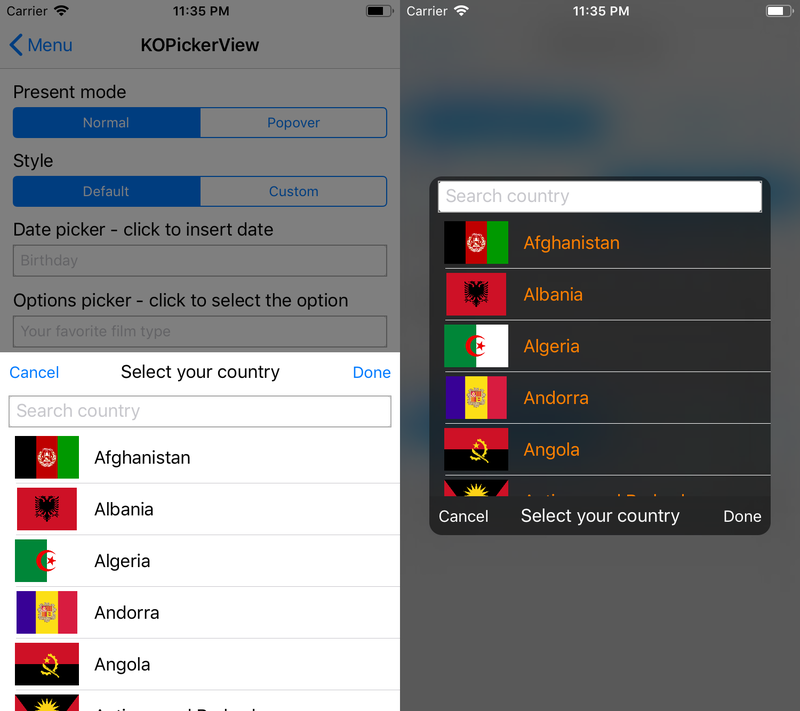 KOItemsTablePickerViewController – Simple way to get the selected option from the user from table. 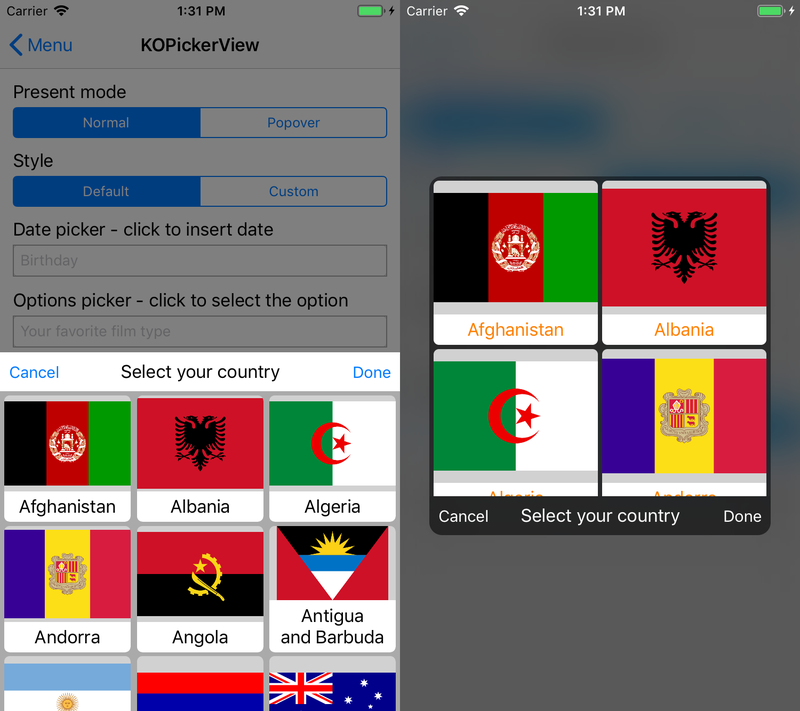 KOItemsCollectionPickerViewController – Simple way to get the selected option from the user from collection. KODimmingTransition – Transition uses presentation with dimming view. KOVisualEffectDimmingTransition – Transition uses presentation with dimming view with visual effect. KOControls doesn’t contains any external dependencies. If you want to stay updated install KOControls by Cocoapods. You can use KOControls manually and customize how you like. One of the simplest way to do that. Copy the KOControls.xcodeproj and folder Sources to the your project directory. In project explorer click "Add Files to ‘Your project’" -> choose KOControls.xcodeproj. Xcode will add automatically KOControls as a sub-project. In project settings -> Target -> Add embeded library -> choose ‘Your project’ -> KOControls.xcodeproj -> Products -> KOControls.framework. And thats all! If you don’t want to build KOControl manually every time when you change something. Go to the scheme settings of your target to the build section and add KOControls build target. You need to add following import to the top of the file. You can add viewController to queue of presenting, to avoid a situation when there can be multiple viewControllers to present at the same time, and only one will be presented. The simplest way to add the viewController to queue of presenting is to use the overridden function present for the presenting viewController. The most detail one, lets you to set presenting viewController. But be careful because modalPresentationStyles that aren’t presenting on current context (like custom or fullscreen) will be presented at fullscreen context outside the queue. To remove item from the queue, you need id of item in queue. Or index of item in queue. Another functions let you to remove multiple items from the queue. The current presented item isn’t in the queue, but you can check is something is presented for the queue or delete presented item if you want. If you want to do something when queue was change (new items were add / remove, queue created / deleted), you can use queueChangedEvent. Text field supports showing and validating an error. You always have to set the error description before show it. To show an error manually you need to change the default validateMode to manual and just change the flag isShowingError to true. errorField.errorInfoView.descriptionLabel.text = "Error description text"
To don’t worry about setting the flag manually, you can use auto validation feature. The default validation mode is validateOnLostFocus. So in example if you want to show error when the email isn’t correct you need to only add the predefinied validator. emailField.errorInfoView.descriptionLabel.text = "Email is incorrect"
You can always adjust the border of the field to the state of: normal, error, focus; by setting borderSettings. Field can be validated with the multiple validators based on function or regex. passwordField.errorInfoView.descriptionLabel.text = "Password should contains 8 to 20 chars"
Error info in default is showing in the field’s superview, but you can change this by setting manually showErrorInfoInView. If you want to show error info always or manually when there is an error you can do this by change showErrorInfoMode. In manually mode you show or hide error info by function showErrorInfoIfCan() or hideErrorInfoIfCan(). Showing error info can be customized by changing errorInfoView and its show / hide animation. You can replace errorInfoView completely by customErrorInfoView, but new view need to implement KOTextFieldErrorInfoProtocol. userNameErrorInfoLabel.text = "Incorrect username try again"
Error view that is showing at the right corner of the field, can be customized by changing errorIconView or replacing it by customErrorView. Controller that calculates progress from given range based on scroll view offset and selected calculating ‘mode’. Initialize "KOScrollOffsetProgressController", and handle progress event or delegate. Controller based on scrollView and min/max offset will be calculating progress (from 0.0 to 1.0) of translation. Axis can be changed by parameter scrollOffsetAxis. High customizable dialog view, that can be used to create you own dialog in simply way. You can create your own content by inherit from KODialogViewController or from its descendants. In below example we want to create items table picker with search field. The first step will be create a class that inherit from KOItemsTablePickerViewController, then we need to override function createContentView to add our searchField to the contentView. private(set) weak var searchField : KOTextField! We can additional customize our picker by changing its parameters. Or we can change the transition. Simple way to get the date from the user. You can use predefined function to present date picker at the screen like below. Action viewLoaded lets you to set title of barView and left / right button to accept or cancel dialog’s result. 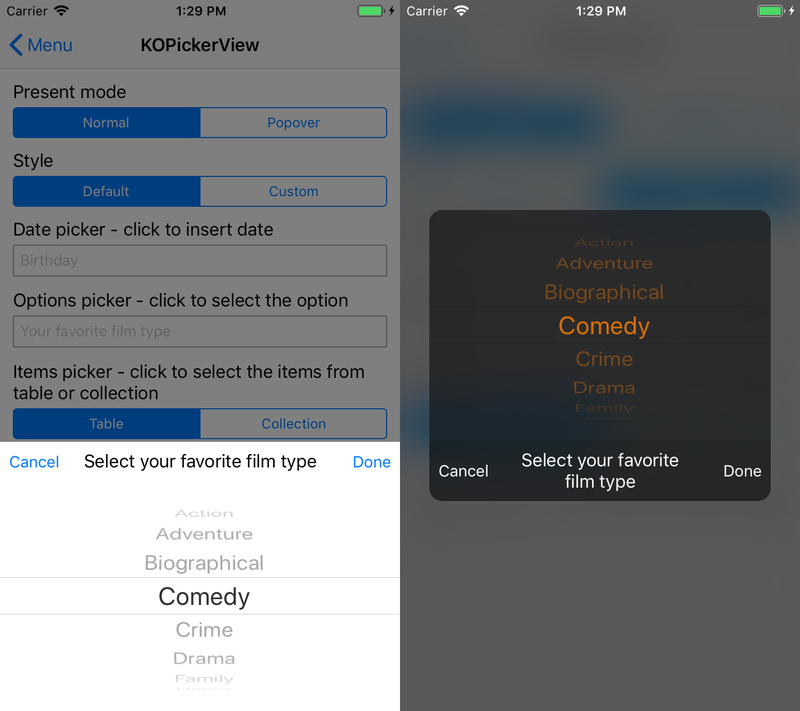 Please go to section about KODialogViewController to find more about customization. Simple way to get the selected option from the user. You can use predefined function to present option picker at the screen like below. Options is the arrays of categories / components, that user can select. Action viewLoaded lets you to set title of barView and left / right button to accept or cancel dialog’s result. Simple way to get the selected option from the user from table. You can use predefined function to present items picker at the screen like below. Action viewLoaded lets you to set title of barView and left / right button to accept or cancel dialog’s result. You need to remember to set contentHeight or contentWidth depending on alignments of main view, because UITableView can’t define how much size need. In the default situation you have to set contentHeight because mainViewVerticalAlignment is different than .fill. Setting and managing items through UITableDataSource need to be handle by the user. Simple way to get the selected option from the user from collection. You can use predefined function to present items picker at the screen like below. Action viewLoaded lets you to set title of barView and left / right button to accept or cancel dialog’s result. You need to remember to set contentHeight or contentWidth depending on alignments of main view, because UICollectionView can’t define how much size need. In the default situation you have to set contentHeight because mainViewVerticalAlignment is different than .fill. Setting and managing items through UICollectionViewDataSource need to be handle by the user. Transition uses presentation with dimming view. Is very simple to use, you need only to set the transitioningDelegate of UIViewController. KODialogViewController has special field for that, named customTransition. Additional settings can be changed by handle setupPresentationControllerEvent and tweaking KODimmingPresentationController. It have to be done before presentating view, in example in postInit parameter of func present. Presentation animations can be changed by parameters animationControllerPresenting and animationControllerDismissing like that. You need to remember that in iOS UIModalPresentationStyle.custom has a fullscreen context, so the view will be always have full screen frame. You can change this by setting KODimmingPresentationController.keepFrameOfView. But the touches outside will not be forwarded to below until you seted KODimmingPresentationController.touchForwardingView.passthroughViews. Transition uses presentation with dimming view with visual effect. It works the same as KODimmingTransition. But UIVisualEffect is setting by the parameter KODimmingPresentationController.dimmingShowAnimation, so don’t change it manually.